Irresponsible debt payments can ruin your financial future. If you want to experience the joys of debt freedom, you need to make sure you stay true to your credit responsibilities. It is not just about making payments. You have to pay it on time. There are so many things that can go wrong if you choose to be irresponsible with your credit obligations. In all honesty, debt is not so bad. In fact, if you use it properly, you can use it to improve your financial position. However, some people get into trouble simply because they choose to ignore their responsibilities towards it. They fail to take the debt payments seriously and they do not use the debt properly. All of these will endanger their finances. The longer the debt remains unpaid, the bigger the problem will become. According to statistics, the average American has a debt of $5,700. When you only consider the houses that owe debts, the amount becomes $9,333. This is a huge amount of debt for a household and if you are showing irresponsible debt payments, that can quickly become too much for you to pay off. If you let it go too far, you might end up ruining your financial future. If you want to keep that from happening, you need to make sure you will handle your debts properly. Fortunately for you, there are many debt solutions that will help you get a handle on your credit obligations. You just have to keep yourself motivated enough to work on your debt freedom completely. One of the best ways to stay motivated about something is by knowing the reasons why you have to do it. Some people find it more effective to think about what will happen in case they fail. 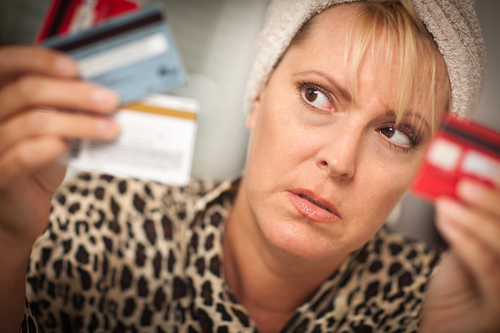 If you are one of those people, here are 5 negative effects of irresponsible debt payments. If you think about it, debt is enjoying something in the present using finances that you have yet to earn. That means anything that you will earn in the future will have to be shared with the debt that you paid in the past. Doesn’t that seem unfair to your future self? Instead of enjoying your income completely, it has to be shared for something that probably does not hold the same value as it did in the past. If you used the debt to pay for a vacation, you will not feel so relaxed once you get home. The effects of the holidays will be cut short once you realize that you now have to begin paying back what you owe. When you are in the midst of paying the debt, the events of your vacation are but a distant memory. Another negative effect of irresponsible debt payments is felt in your financial goals. According to a research done by the University of Scranton, 9 out of 10 people who set New Year’s goals fail to meet their targets. There are a lot of reasons why this happens and we can bet that one of them involves personal finances. Usually, a goal is in need of financial support in order to happen. But if you are irresponsible with your payments that means a longer repayment plan. It will cost you more. Instead of being able to use the money to turn your financial goals into a reality, you have to use it to pay off debt. A lot of people fail to realize how debt can be used to improve your financial position. Some only look at it as an extension of their wallet. The truth is, there are some debts that are good for you – like a mortgage or a student loan. Both will give you what you need to improve your personal net worth. However, if you display irresponsible debt payments on, let’s say, credit cards, that can affect your ability to borrow a mortgage or student loan. When you do not meet your payments, your credit score goes down. A bad credit score can keep you from getting a low-interest rate on your loan – thus saving on your home or student loan. Debt can also be the cause of stress. If you cannot pay it off, it will continue to nag you at the back of your head. It is not a pleasant thing to go through. You can lose sleep over it. And if you are really irresponsible with your payments, it might end up going into collections. When debt collectors enter the picture, you can bet that your stress level will rise significantly. It is not something that you should ignore. Stress can lead to a lot of health issues and it can affect your life in a really negative way. Finally, if you continue with irresponsible debt payments, you will end up damaging your relationships. There are so many forces working against you. First of all, the stress will make you cranky. It can keep you tense and that can put a strain on the mood of everyone around you. Another reason why it can destroy a relationship is the fact that nobody wants to be with someone who constantly makes their finances hard. According to a survey, 28% of the people who get married do so for financial stability. It is no longer true that money cannot buy happiness. You need it so you can afford to enjoy the things that you want out of life. Without it, you cannot really find peace – because you will constantly be stressed thinking about how you and your family can survive. As you can see, these 5 negative effects can be quite scary. If you are having a hard time motivating yourself to be more responsible with your debt payments, you should consider the fact that these 5 effects can happen to you. It doesn’t really take much to put the irresponsible debt payments to a halt. You just have to apply some self-control and discipline. It also does not mean you should stop using credit. Well, if you have a lot of debt, it is wise to stop getting more debt – but it is only temporary. Using debt has its advantages. What you need to do is to learn how to manage your credit accounts properly. Fortunately for you, being responsible with your debt payments will help you develop the right habits that will keep your balance in check. Here are some helpful tips that will keep you from being irresponsible with debt payments. First of all, you have to make sure you put your debt payment in your budget. This will ensure that it will be funded every month. If you know that you have an emergency fund (or at least some of it), you can safely prioritize your debt payments. As long as you have a plan, you can make a tight budget work – even one that includes a lot of credit obligations. If you are forgetful, automating your payment is a great way to avoid irresponsible debt payments. Just make sure your account has enough funds to finances your payments. That way, you do not have to worry about falling short or missing a deadline. If you are not comfortable with automating your payments, you might want to consider setting up reminders. This is the next best thing. You can set up a calendar that will notify you through your email or mobile device about an upcoming payment. Finally, you can avoid irresponsible debt payments if you have a debt relief program. There are many options for you to choose from. You have credit counseling, debt consolidation loans, debt settlement, debt management, and even balance transfer cards. You just have to make sure you analyze your financial and credit situation first before you make a choice. It will help you completely get out of debt. While you are at it, you might want to practice the good credit habits that will help make the effects of debt relief last longer.